When it comes to easing stress and anxiety, aromatherapy is an effective remedy that has been practiced by civilizations for thousands of years. Aromatherapy involves the use of essential oil where the aromatic properties of the oil enhance the mind and body. Different types of essential oil provide therapeutic effects of their own. For relieving stress and anxiety, Frankincense essential oil has been proven to be highly effective. The calming and sedating scent of Frankincense is known to provide soothing to anxious minds. 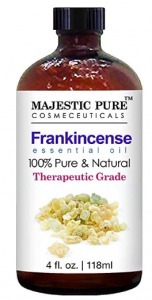 The name Frankincense is derived from ‘franc encens’, which carries the meaning of ‘pure incense’ in French. It indicates the dried resin of the Frankincense tree that is native to the Middle East and Africa. Frankincense essential oil is derived from the dried Frankincense resin and carries a woody and earthy scent. Frankincense Carteri (Boswellia Carteri) – This variant is great for protecting skin from the effects of aging and boosting respiratory system. Its earthy scent is also known for calming the mind effectively. Frankincense Frereana (Boswellia Frereana) – Typically found at higher grounds, the Frankincense Frereana has superior anti-inflammatory and anti-bacterial properties that make it a great remedy for inflammatory issues like arthritis and allergies. Frankincense Sacra (Boswellia Sacra) – Essential oil made from Frankincense Sacra gives off a strong earthy aroma that is typical of Frankincense. When used with citrus based oils, it produces great anti-microbial properties on top of its native anti-inflammatory effects. Frankincense Serrata (Boswellia Serrata) – Arguably the oldest type of Frankincense known to human civilization, it carries a slightly sweet aroma that distinguishes itself from other variants of Frankincense. It is a powerful antiseptic and also popularly used for meditation. You may know realized that there are different types of essential oil used in aromatherapy. Oils extracted from the dried resin of Frankincense is known for its effectiveness form relieving anxiety. It has been recorded that the burning of Frankincense during spiritual ceremonies have brought feelings of jubilation to practitioners. While these claims are further enforced by modern society practicing aromatherapy, does Frankincense actually helps alleviate anxiety from the perception of science? A study was conducted by a team of researchers from Johns Hopkins University and Hebrew University in Jerusalem to investigate the relations of burning Frankincense with reducing anxiety and depression. The study involves administering incensole acetate, an active compound in Frankincense, to mice. It was observed that the incensole acetate affects a part of the brain in the mice linked to emotions and part of nervous system that reacts to anxiety and depression medications. Suggestions that Frankincense essential oil helps in reducing anxiety has been backed by scientific studies to a certain extent. Besides anxiety, are there more reasons to use Frankincense essential oil in aromatherapy? It seems so. Here are other benefits of using Frankincense essential oil. Improve Digestion – There are suggestions that frankincense helps alleviate digestive issues by increasing the secretion of gastric acids. It also promotes the peristalsis motion for a smoother food movement. May Treat Cancer – Preliminary studies have linked Frankincense as a possible remedy that can help treat cancer. A study by that involves University of Oklahoma Health Sciences Center, Oklahoma Medical Research Foundation Microarray Research Facility and Oklahoma City Veterans Affairs Medical Center, found that the presence of frankincense oil can help suppress the growth of bladder cancer cells. Prevent Inflammatory Diseases – According to a scientific publication by the Institute of Pharmaceutical Sciences, University of Tuebingen, boswellic acids that are present in Frankincense can decrease the production of leukotriene, a substance linked to inflammatory diseases. Improve Wound Healing – Another research conducted by doTerra shows the capability of Frankincense essential oil in aiding wound healing and lessening the chance of forming a scar. Frankincense oil is a versatile essential oil that has immense benefits when applied the right way. There are a few methods to use Frankincense essential oil to relieve anxiety or for general well-being. Diffuser – One of the most popular methods is by adding a few drops of Frankincense essential oil to an aromatherapy diffuser. The earthy fragrance of the oil will disperse to each corner of your room and you’ll benefit from inhaling the Frankincense droplets in the air. Topical – Frankincense essential oil can also be added to an unscented carrier oil to be applied topically to the damaged skin. Bath – You can dilute Frankincense essential oil in a bath to promote relaxation for mind and body. Frankincense essential oil is considered to be generally safe in diluted form. Minor cases of skin irritation are reported from the use of Frankincense oil. Before using Frankincense oil orally, it is best to check out the suggested dosage on the manufacturer’s label. You should dilute Frankincense oil in other edible carrier oil before ingesting it. Avoid contact with sensitive areas like eyes and ear. Women who are pregnant or breastfeeding should avoid using Frankincense essential oil as there is little evidence that suggests the safety in doing so and vice versa. If you’re in doubt, consult your doctor before using Frankincense essential oil. Purity – You’ll want your Frankincense essential oil shipped with a high level of purity. This means that it needs to undergo steam distillation or CO2 extraction to preserve its therapeutic properties. Usage – Some Frankincense essential oil is manufactured for external use only. If you intend to take Frankincense oil orally, ensure that the label specifically states it’s safe for oral intake. Also, you may want the essential oil to be organic-certified. General Feedback – Checking out feedbacks from other customers help in minimizing the risks of getting an unsuitable product. It also affirms the credibility of the manufacturers and instills confidence in the products. Bottle – Frankincense essential oil is sensitive to UV and heat. Only choose Frankincense oil that is contained in an amber glass bottle. Plant Variant – The most commonly used variant for essential oil is Boswellia Serrata. Other variants may have slightly differing therapeutic effects. Do check the label of the essential oil for the variant type. 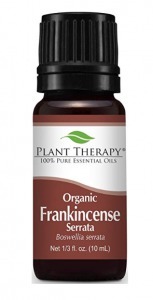 Frankincense essential oil is commonly available both online and offline. You can shop for it at your local cosmetics or wellness stores. Alternatively, there is a range of manufacturers and herbalists that are selling Frankincense essential oil online. If you’re buying Frankincense essential oil through online retailers or herbalists website, ensure that they provide a hassle-free refund policy, in the rare case that you receive a defective product. Searching for the right Frankincense essential oil can be an overwhelming process, considering the hundreds of different product available on a major marketplace. I’ve spent hours to handpicked some of the best Frankincense oil that can help you ease anxiety. Zongle Therapeutics is on a mission to deliver high-quality essential oil to the public while keeping it at an affordable price. It does so by sourcing essential oil from carefully selected suppliers around the world. Zongle offers both organic and natural essential oils. 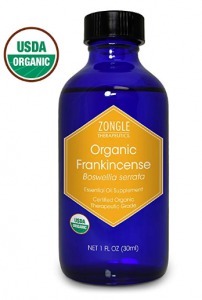 Frankincense essential oil is usually diffused or applied topically but if you’re looking for one safe for ingestion, this bottle of Frankincense oil from Zongle is the right fit. The Frankincense resin is harvested from sustainable farms with organic agriculture practice. Each batch of the oil undergone strict quality testing to ensure it is free from microbes, heavy metal and any form of pesticides. With that said, it is always recommended that you talk to your doctor before taking Frankincense essential oil orally, even if it’s certified organic. The oil was extracted from the Frankincense resin harvested in India through steam distillation to ensure its purity remains intact. The undiluted form of the oil helps you to relieve anxiety by diffusion or ingestion. Add 4 drops of the oil into your aromatherapy diffuser to start enjoying the therapeutic effect. Helps to calm the mind. Majestic Pure was founded with the belief that the power of plants is key to ensuring a well-nourished body and mind. Besides harvesting from natural plants, the formulations are perfected through generations of herbalists of the founder lineage. The purity of its essential oils ensures Majestic Pure a loyal customer base around the world. This is a therapeutic grade Frankincense essential oil that is made from the Boswellia Serrata variant. It is extracted through steam distillation to ensure its healing properties are well-preserved. No chemical fillers are added to the oil. This undiluted Frankincense essential oil is only meant for topical application or diffusion. If you’re applying to your skin, dilute the Frankincense oil onto a carrier oil and test it on your elbow to ensure you’re not allergic to it. If you’re using an ultrasonic diffuser, add a few drops of the essential oil into the water and the fragrance of Frankincense will soon permeate the room. You’ll soon find a soothing sensation that reduces anxious thoughts. Some individuals do not like the scent. At Plant Therapy, only the purest high-quality essential oil matters. The company goes beyond pleasing regular adult customers as it created the KidSafe® range of products. It intends to make essential oil benefits for both adults and their little ones in the family. This bottle contains Frankincense oil that is derived from the Boswellia Serrata plant. It is certified organic by the USDA and is verified to be free from any carriers or additives. This leaves you the purest undiluted form of Frankincense oil that can be used topically or with a diffuser. As typical to natural Frankincense oil, you’ll get the woody fragrance as you unbottled the oil. Having it as part of your aromatherapy session helps to alleviate anxiety. You can also apply Frankincense oil topically as it does provide healing effects for the skin. Just be sure to dilute it with a carrier oil. Some may find the scent unpleasant. Customers are the number one priority for Wellness Scent. The company doesn’t believe in hiking up the price simply because the essential oil is pure and organically sourced. Each of Wellness Scent’s essential oil is guaranteed to be organic and Kosher. Harvested from Boswellia Serrata in farms that comply to organic practices, the essential oil is extracted delicately with steam distillation. This ensures the unique qualities of the Frankincense are preserved in its original form. The oil is shipped in an amber glass bottle to prevent exposure to sunlight that may compromise its quality. 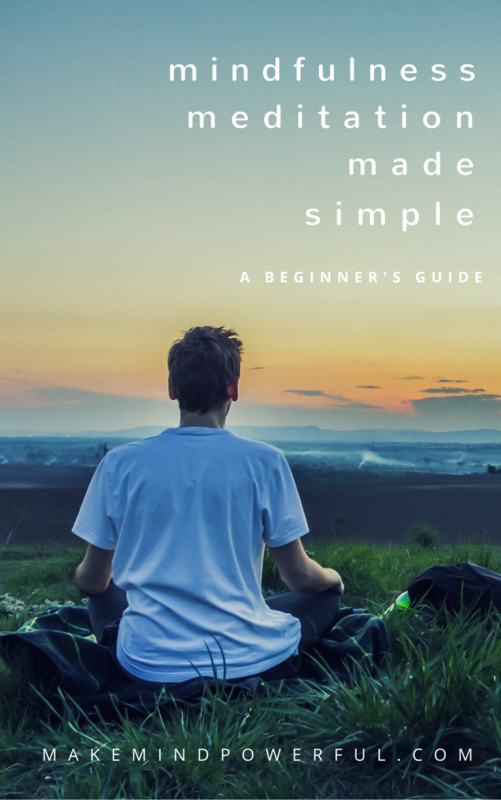 You’ll also receive 6 e-Books that guide you on how to use the Frankincense essential oil effectively for your mind and body. USDA Certified organic Frankincense oil. Some individuals found the scent too weak. US Organic continues to amaze its customer with enriching wellness product that is sourced naturally from nature. Only growers that produce high-quality ingredients are qualified as suppliers for the company. It prioritizes quality in every aspect of the production process and operates from a GMP certified facility. 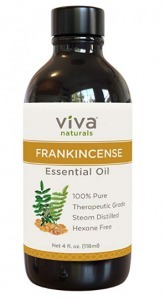 You’ll get both convenience and healing with this bottle of Frankincense oil. It features an improved cap and dropper that make dispensing the oil a hassle-free process. It is made from Boswellia Serrata that are certified to be organic. With no additional fillers in the oil, it gives off a pure wood-like aroma the diffused or applied topically. Aromatherapy with Frankincense oil is known to provide a calming effect. If you don’t have a diffuser, you can add 4-5 drops to warm water and inhale the vaporized oil. The smell is too weak for some buyers. Viva Naturals was founded in 2011 by a group of wellness enthusiasts who practice what they preach in life. The team ensures that nothing gets in their way of producing safe and pure wellness products. But quality doesn’t mean a hike-up price when Viva Naturals is concerned. This highly potent Frankincense oil is extracted from the sap of the Boswellia Serrata plant by steam distillation. Its purity remains intact and was subjected to third party testing to ensure no pesticides or harmful chemical are present in the oil. The oil is further protected from UV and heat by the amber glass bottle. Adding a few drops into your diffuser is a perfect way to create the soothing environment required for a good night sleep. You can mix the Frankincense oil with a carrier oil to apply on your skin to good effect. Steam distilled ensures high potency. Great for relaxing the mind. Scent can be relatively weak. Art Naturals holds on to the philosophy that nature is the important source of nourishment to humans body, mind, and spirit. It uses only the finest ingredients sourced from the planet to produce affordable yet high-quality wellness products. This bottle of Frankincense essential oil is separated from the resin of Boswellia Serrata with steam. With its therapeutic properties well-preserved, it promotes relaxation when used as aromatherapy, especially if you’ve been having a tough day. If you’re using it topically, ensure that the Frankincense oil is diluted with a carrier oil before applying on the skin. A 3% dilution is recommended for a general message and as a body care essentials. You’ll find a premium glass dropper to help dispense the right ratio. Steam distilled to preserve its properties. Some found the scent underwhelming. Living Pure is a relatively young company in the essential oil industry. It uses the finest ingredients from all over the world to produce high-quality essential oils that are organic and free from additives. The team at Living Pure is unwavering in its commitment to quality. When it comes to potency, you’ll want the Frankincense oil to be undiluted and extracted through steam distillation. This ensures that the therapeutic properties are preserved and effective in promoting relaxation. You’ll find no traces of toxins and fillers in this unfiltered bottle of Frankincense oil. For stress relieve or promoting a pleasant sleep, you can add a few drops of the oil into an ultrasonic diffuser. The earthy scent of Frankincense will spread to all corners of the room and the mild sedative effect will kicks in. Sourced from organic Frankincense plant. Helps as a sleep aid. The story of Essential Oil Labs begins with the journey of a family to search for drug-free alternatives methods to improve personal well-being. This leads to the discovery of the benefits of essential oils that have been used for thousands of years. Now, Essential Oil Labs has been consistently producing affordable pure essential oils. 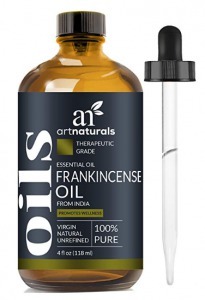 This premium Frankincense essential oil was launched not long ago in May 2018. It was extracted via steam distillation from Boswellia Serrata from India. The woody fragrance indicates the purity of this undiluted Frankincense oil. You’ll find the oil effective in calming anxiety and helps insomnia. Not only do you get to sleep easily, but you’ll also wake up refreshed thanks to the healing properties of Frankincense. You can also use the Frankincense oil for body care. A complimentary guide shows you the steps to add the oil into lotion and other products. Helps with anxiety and insomnia. Overwhelming smell for some buyers. doTERRA is unmistakeably the leading brand for essential oil. It was formed in 2008 and started offering 25 single oils and 10 blends of the finest quality. Today, the doTERRA brand is well-known over the world, thanks to its products quality and superior business model. This bottle of essential oil is extracted from the resin of three different Frankincense variants, sacra, papyrifera, and frereana. The combined qualities of the species will provide soothing effects for relaxation. You can use the oil with diffusion or topically. If you’ve been using Frankincense oil, you’ll find the warm and spicy aroma familiar. 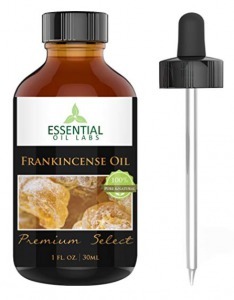 While this Frankincense essential oil receives encouraging feedback from users, the price may discourage some users from getting it. Why Frankincense smells differently from the same brand? You may come across comments from Frankincense users that the smell varies between different brands. Some even claimed that a new bottle of Frankincense oil from the same manufacturer smells differently from the existing ones. As with anything grown naturally, soil conditions, and climates can be contributing factors to the varying aroma. The chances of natural conditions affecting the aroma are high if the distillation process and other quality control measures have been streamlined by the manufacturer. I trust that this guide has helped you narrow down the options of Frankincense essential oil for you.